As a barbecue competitor and cooking instructor, I’m often asked what my favorite barbecue is. When I say ribs, the next question is how do I like to cook them? Do I cook them competition-style? The truth is when you’re on the road competing over 30 weekends a year and another 20 weekends teaching barbecue classes, eating more barbecue is not the first thing that comes to mind. After a long weekend on the road cooking, I prefer Mexican or Japanese food. However, whenever I cook ribs for myself, I like them simple with a nice Tex-Mex influenced garlicky rub and with some spicy Pico De Gallo. No, I’ve never turned in this recipe for a contest and I’m not sure it will do well but that’s how I like my ribs when I make them for myself. When I was a student at Texas Tech in the early 80’s, I first learned how to cook ribs from one of the Mexican cooks in the cafeteria where I worked part-time. Latecia’s recipe was simple and delicious. You dusted your ribs with some salt, pepper, granulated garlic, and chili powder and grill them. Once done, the ribs were still chewy and you squeezed some lime on it and ate it with some freshly made pico de gallo. Over the years, I’ve modified her recipe to suit my tastes as they evolved as I moved out to California for graduate school after I left Texas Tech in Lubbock. Sometimes I make it with a 50-50 blend of my SYD competition Hot rub coupled with my new SYD competition Chicken rub which won the 2012 KCBS season national Chicken Championship. Sometimes I go with my simple 1985 retro recipe. Give it a go either way if you want to see how I like my ribs. 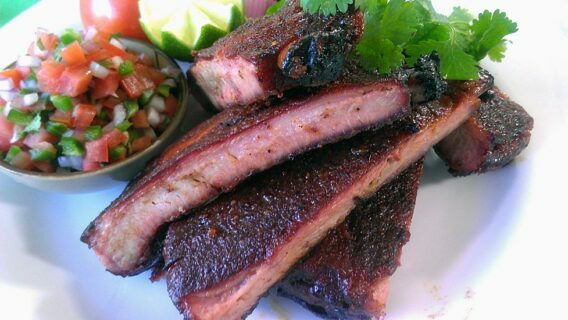 Who knows, once you try it, you may find you also enjoy ribs with spicy Pico Di Gallo and a squeeze of lime juice! Cut the ribs into individual bones and serve with a squeeze of lime and some spicy Pico De Gallo. Any particular reason why there is no cilantro in the pico? because I forgot to include it! LOL! I’ll update the recipe to include chopped cilantro! Harry – These really look good (and simple too!). My dad use to simply char-broil BB ribs with pineapple juice and I loved them as a kid. Speaking of char-broiled ribs – Ever been to the Charles Vergos’ Rendezvous in Memphis? Never been myself, but I see where they do ribs with a more direct heat over hot coals and the ribs are done in about an hour. Funny how this is always considered a must-stop for "Memphis-style BBQ", yet they are really char-broiled with a dry rub. Have not tried their ribs but they sure sound good from your description. I’ll be in Memmphis in May for the MIM contest so I will try to check them out! Thanks for the tip. There are many ways to cook a good rib and grilling them is certainly an option. I will try to check out Charles Vergos’ place next time I’m in Memphis.